KIEV, Ukraine -- Ukraine said on Wednesday it would launch the first test shipments of goods this week to Kazakhstan that would bypass Russia because of the Kremlin's new trade embargo on Kiev. Ukrainian Prime Minister Arseniy Yatsenyuk, pictured on December 11, 2015, admitted that the Kremlin's most recent steps against Kiev "significantly complicated" Ukraine's trade. Russia this month slapped new sanctions on Ukraine in response to its decision to enter a much disputed free trade and political association agreement with the European Union. Moscow's latest bans on its neighbour include transit restrictions on Ukrainian products to other former Soviet republics in Central Asia and the Caucasus. Ukrainian Infrastructure Minister Andriy Pyvovarskiy said during a cabinet meeting that "experimental" deliveries via Georgia and Azerbaijan would be shipped to Kazakhstan on Friday. This "Silk Road will not only give Ukrainian goods alternative access to markets in which we have historically been very strong, but also create a new (trade) route between Asia western Europe," Pyvovarskiy said in televised remarks. 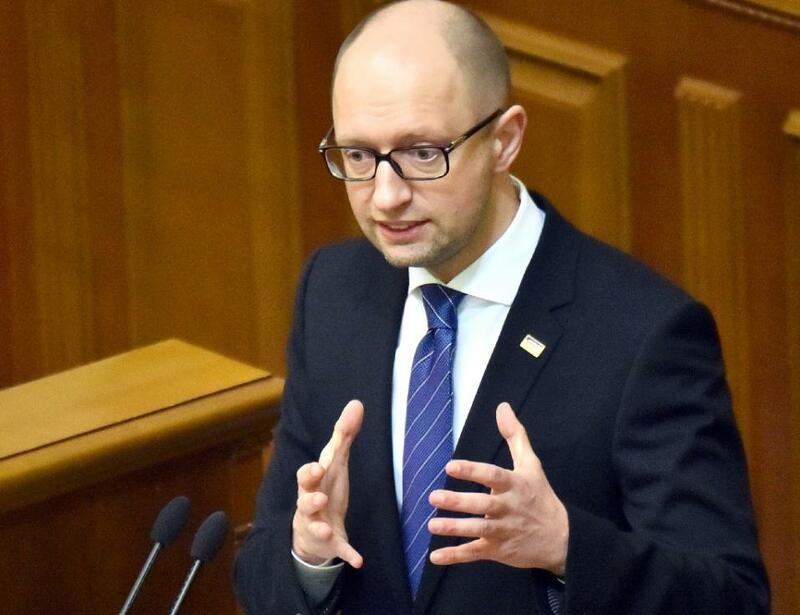 Prime Minster Arseniy Yatsenyuk -- a hate figure in Moscow for his aggressive stance against Russia and strong support for closer relations with the West -- admitted that the Kremlin's most recent steps against Kiev "significantly complicated" Ukraine's trade. Yatsenyuk added that he had already discussed the unprecedented train deliveries with his Kazakh and Azerbaijani counterparts. "Our goal is to agree on a single transport tariff, and to load this train to its fullest capacity." There was no initial public reaction to Ukraine's announcement from Russia -- a country that has had its own trade spats with Kazakhstan in the past year. The escalating trade war between Moscow and Kiev is focused on an a EU free trade agreement that Russia stiffly opposed as it sought to preserve influence over former territories and enrol Ukraine in its own post-Soviet economic bloc. Former Ukrainian president Viktor Yanukovych's shock decision to scuttle the EU free trade pact in November 2013 led to his ouster by waves of street protests in Kiev just three months later. His downfall and the rise of a new pro-European leadership in his place was followed by Russia's March 2014 annexation of Crimea and the onset of a separatist conflict in eastern Ukraine that Moscow lies and denies either instigating or backing. Russia's share of Ukraine's total export fell from around 30 percent during Yanukovych's presidency to just 12 percent in 2015. That figure is likely to drop further as Ukraine tries to refocus its agricultural and industrial exports on western Europe and Asian markets such as China. The Dutch international banking corporation ING predicts that Ukraine will become Kazakhstan's third largest source of imports by 2017. ING said the energy-rich Central Asian nation primarily imports Ukrainian vehicles and transport equipment. Pyvovarskiy failed to specify what products would be shipped to Kazakhstan via the Caucasus this week.